Summer is at the door, and what is more refreshing than a lemonade or a glass of limoncello? 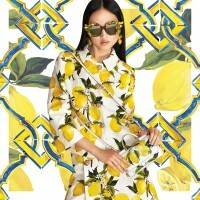 Lemon print apparel and accessories by Dolce&Gabbana. The typical fruits of the south of Italy, lemons are the protagonists of a collection which just screams Italian Summer. Flirty bralets enhanced by flounces, mini skirts, mini dresses, sundresses, leggings and a vast selection of swimwear are printed with pictorial reproductions of succulent lemons leaves and blossoms. The lemon print comes in two versions, one with a summery and vacation appropriate white base, which mixes perfectly with both block white and denim, and a more city oriented black background, for a sophisticated look which still bears the fruits of summer. The Italian Summer collection, comprises many covetable accessories featuring the lemon print. From scarves passing by Sicily bags, Dolce Boxes, small leather goods and footwear, like espadrilles, flatforms and elegant pumps, summer is only one lemon print accessory away. Lemon or orange print apparel and accessories for fun Summer fashion.